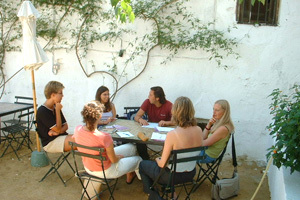 Studying Spanish in Vejer de la Frontera is something quite unique. Students attending Spanish courses at our school have the chance to experience 'the real Spain' as well as learn Spanish. The Spanish courses run mainly in the morning leaving the afternoons and weekends free for beach trips and a range of optional visits and excursions - and as an added bonus the weather is warm and sunny throughout most of the year! Our school, located in an historic building, has 8 classrooms, Internet café, library, two interior patios, garden with orange trees and jasmine, as well as a roof-top terrace with amazing views. Excursions are offered to Seville, Cordoba, Ronda, Cadiz and Morocco. Students attending Spanish courses at our school may also practise horse-riding, scuba-diving, snorkelling, hiking, paragliding and windsurfing. This course combines 10 Spanish lessons/wk with 10 Flamenco dance lessons/wk or 10 Spanish guitar lessons. The dance lessons are conducted in the school's on-site dance studio, with fully qualified Spanish dance instructors. Also included is rhythmic clapping, use of castanets, + activities programme: lectures/discussions, videos on Flamenco and visits to places of interest. With just 10,000 inhabitants, Vejer is small, incredibly beautiful and very safe. Our school is in the historic heart of Vejer. The summer course consists of 20 Spanish lessons/wk., host-family accommodation, plus organised activities in the afternoon/evening: theme evenings, beach sports, guided walks, fiestas, trips to one of the magnificent local beaches, 1 full-day and 1 half-day excursion/week. All accommodation is within walking distance of the school. Airport transfers are included from Jerez Airport, optional from Seville/Malaga Airports.